What is the Triple E? The Triple E is a practical framework that measures the degree to which the technology in a lesson is helping students meet the learning goals. Unlike other technology frameworks, the Triple E Framework focus is on the learning goals, and not specific technology tools. The framework draws on educational research concerning effective and ineffective practices with technology tools from the past two decades. The Triple E measurement tool was developed specially for K-12 teachers and administrators to use in lesson plan development, evaluation of the potential effectiveness of educational apps in learning, and evaluation of the potential effectiveness of tech tools in lesson plans. The framework is based on three components: Engagement in learning goals, Enhancement of learning goals, and Extension of learning goals. While these terms are often used interchangeably, they are distinct and different. The Triple E Framework defines each component shares what makes each piece unique. While not a perfect science, the Triple E measurement tool provides a benchmark for what educators should be thinking about when considering a technology tool for learning. Meaningful use of technology in the classroom requires teachers to integrate technological affordances with pedagogical approaches for the specific subject matter to be taught (Mishra & Khoeler, 2006). The Triple E Framework, developed in 2011 by Professor Liz Kolb at the University of Michigan, School of Education, was created to address the desire for K-12 educators to bridge research on education technologies and teaching practice in the classroom. There are decades of reliable and useful research that provides guidelines on effective practices when using technology tools for eliciting learning growth. The research clearly points out that effective technology integration begins with good instructional strategies and not fancy tools. The Triple E Framework was designed for educators to easily evaluate how to select tools to meet their learning goals, and ultimate design learning experiences so the tools have a positive impact on student achievement and learning outcomes. 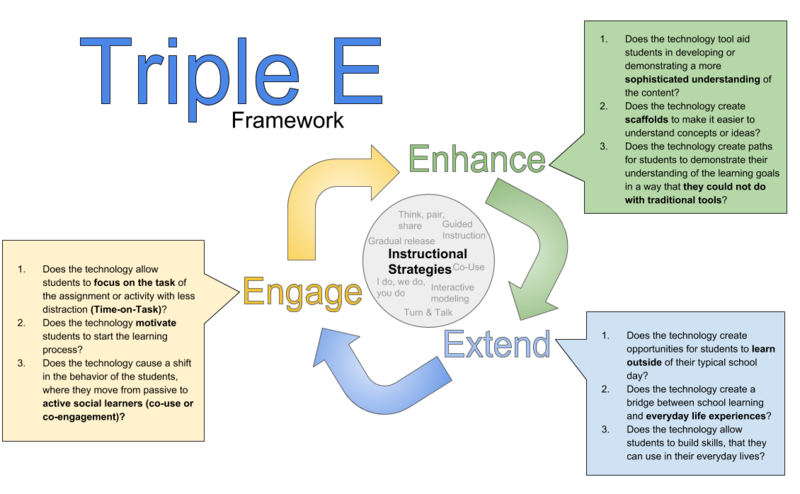 The Triple E Framework is meant to be used as a coaching tool to support teachers in their instructional choices around and with technology tools. is the Triple E Valid and Reliable? ​Yes! A recent independent mix-methods study conducted in 2018 found the Triple E to be both valid and reliable. More to come on this soon! The research on technology and learning over the past decade is fairly clear, technology should be integrated based on what we already know about good teaching and pedagogical practices. Dating back to the late 19th century, the foundation of current teaching practices is based on the work of pragmatism. Pragmatists like John Dewey (1897) pushed for learning to be embedded in the student's authentic everyday lives, socially constructed knowledge, active/hands-on learning and full of choice. Since the early 1990s Research has found that educational technology with a "drill and practice" approach often has no effects on learning or cognition. Yet, most technology tools created for education are still drill and practice and in the lower-order of Blooms Taxonomy. Despite media often claiming a new piece of technology will "revolutionize" learning, that is almost never the case. The Triple E framework takes this fallacy of technology as the magic bullet learning into account, and allows teachers to become critical consumers of making mindful choices around technology tools in their teaching. It is a simple framework, based on research around teaching and learning practices with technology tools. The framework is intended to help educators create lessons that allow students to use technology to meet and add value to learning goals as active, social, creative learners, in authentic ways. The framework also helps K-12 administrators evaluate the connection between potential learning outcomes and the technology they are seeing in their teacher's classrooms. Some educators tend to be haphazard with technology tools, often trying new hardware or software because it's shiny or new, dismissing older technologies with an assumption that older=poor technology use. Today, few educators would argue that technology is a TOOL to help students reach learning goals. How do educators measure a tools ability to help students reach learning goals? There are a number of frameworks that teachers use for integrating technology (SAMR, ADDIE, TIM, TPACK, RAT), while all of them have benefits, none directly focus on how technology helps students achieve learning goals. While TPACK, developed by Mishra & Khoeler (2006)--technology knowledge, pedagogical knowledge and content knowledge is the heart of integration, it is a conceptual framework and just needs a practical tool to help teachers envision what it may look like in practice. The Triple E is that practical tool that brings together instructional strategies, learning goals and purposeful tool selection. Most frameworks focus on how technology substitutes for traditional tools or if the technology use is creative, but not if the tools were able to actually leverage the learning goals. As the U.S. has become focused on standardizing learning and outcomes, making sure that students are using their time to meet learning goals is even more vital when integrating technology. This is where the Triple E Framework can help to extend the current models.